What's a girl to do when every single time she opens the freezer she sees half a package of phyllo dough just begging to be used? I'll tell you what she does. She makes glorious stinky cheese treats. A simple, flaky casing surrounding a creamy, pungent mixture of feta, ricotta, and milk that can be picked up and nibbled on throughout the day is a glorious thing. And yes, of course I over-stuffed mine. I can't seem to hold back when it comes to cheese. You must remember that I am a self-admitted cheeseslut. And I'm not ashamed. Let those babies burst at the seams...I don't mind licking my fingers. The only thing that could make these parcels any more fabulous and stinky? That would be a good side of Sundried Tomato, Walnut, Olive and Oregano Relish and/or a side of Parsley, Raisin, Pine Nut, and Caper Relish. And as long as you share, there's no need to worry about your breath offending. Offend together, that's my motto. Preheat oven to 350° F. Grease a 9" x 13" baking dish. Mix and mash feta, ricotta, and milk together in a small bowl. Lay phyllo dough out flat and keep loosely covered with a damp cloth or towel between uses. 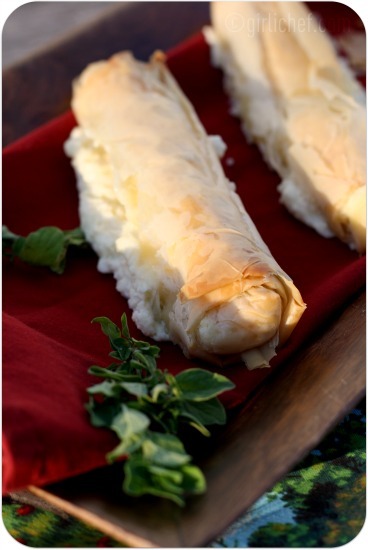 On a large cutting board (or similar work surface), lay one sheet of phyllo dough out horizontally. Brush with olive oil. Repeat with two more layers of phyllo and olive oil. Spoon 2 tablespoons of filling along one short end, leaving about an inch border on each side. Spread filling in an even line. Roll it up fairly tightly, starting with a roll to cover filling, then folding in the inch overhang and continuing to roll. Brush the entire surface with more olive oil. 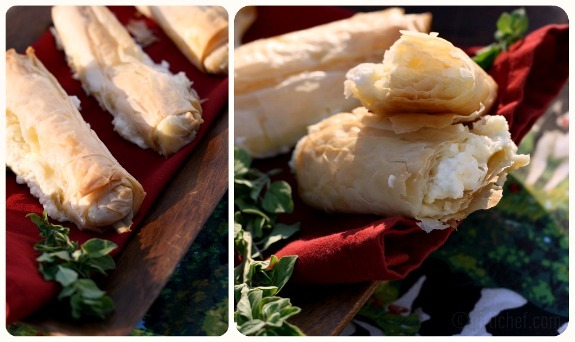 Arrange in prepared pan (seam side up) and repeat with remaining phyllo to make 8 more rolls. Bake for ~30 minutes or until golden. Cool for just a bit until you're able to handle. Enjoy warm. Spread with one or more piquant relishes for an ultimate flavor experience. Fantastic... This looks absolutely gorgeous!!! Your tiropita cheese pies look fantastic! My husband and I love cheese, and I can't help but think how nice they would be as part of a dinner for two with a glass of good red wine. I can't wait to get back to my kitchen! I guess a girl's gotta do this...it's pretty perfect to me. I love phyllo and cheese but these look pretty big to me and I'm not quite sure I could manage a whole one. I might need to add just a little bit of something green to them! Just in time. I have some homemade ricotta I was going to have to toss out and now I don't. I can make these! As a fellow cheeseslut I say YEAH BABY! Cheeseslut? Too funny. I'm right there on the corner with you. These look really good Heather. They are pretty big. I like a half as a serving w/ one of those relishes on top of a bed of micro greens. Yum!! Those look so flaky and delicious--my boyfriend would go crazy for these! Offending together...ha ha! These look fabulous and I'm totally with you. I always overstuff when it comes to cheese. Crispy, crunchy, and cheesy....just doesn't get better. Rock on, Cheeseslut! Hooray for stinky cheese. There is no such thing as overstuffing when it comes to something so delicious. ;-) My former roommate's mom used to make these---they are one of my favorites. Fan - Tas - Tic! I love me some stinky Cheese!.. and the fact that you rolled it in dough sheets and Fried it! a girl after my own heart! I'm definitely after some of that caper relish you got there too! Stinky cheese treats. Yeah! That sounds like a decadent treat and with walnut relish...perfection. Yum! I love cheese too and have some phyllo dough in the freezer now. These look amazing! Oh, my kids love these! I found you on cookbook Sunday at Sue, I will put like! 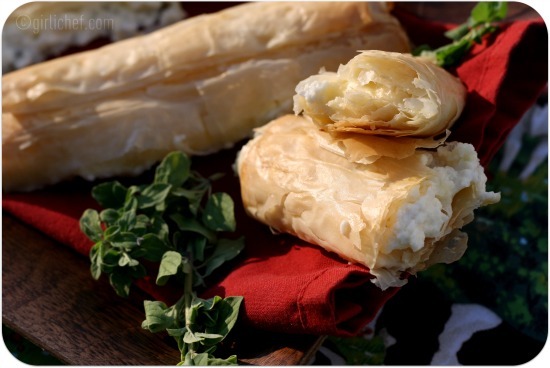 Divine - I totally have to try these - and I have phyllo and feta in the fridge right now, so no reason not to. I love your motto of offending together - makes perfect sense! And there's never anything called 'too much cheese', I would totally over-stuff these babies too! Yum, this greek cheese pies look like/remind me of vietnamese lumpia(a lot of street sellers of lumpia in this little corner of the world). I want a taste of these wright now please! Thanks for linking w/ See Ya In the Gumbo! Holy smokes those cheesy bits are fantastic sounding! I want them now. Like right now. They look like something that makes you too full but you keep eating anyway. These look so crispy and loaded with CHEESE!